Will Twitter Predict The Winner Of The Melbourne Cup Again? Whybin\TBWA brought back the Melbourne Twitter Cup for TAB in an attempt to see if Twitter could correctly predict the winner of the race that stops the nation. 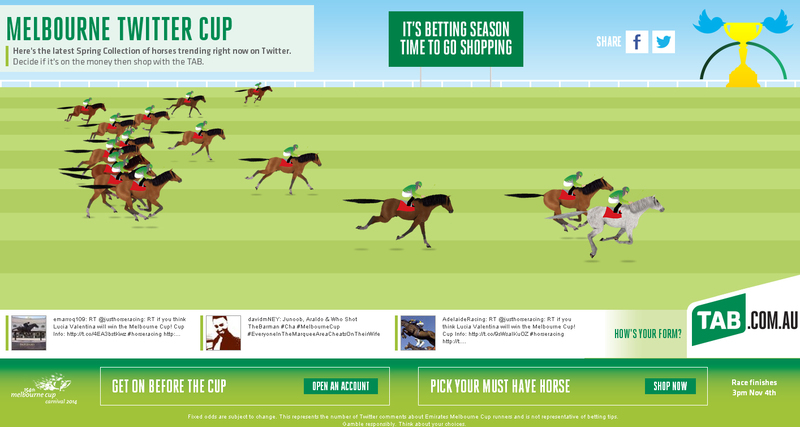 The activation is a virtual online horse race powered by Twitter mentions. In the lead up to the race earlier today, each time a horse got a mention, it moved forward on the virtual track. Just before 3pm Fawkner was in front, ahead of Admire Ratki. Unfortunately, the race was something of an upset with Protectionist taking home the cup. The Melbourne Twitter Cup placed the horse third. Last year Fiorente to correctly tipped to win. Best of three, TAB?